December in the Northern Hemisphere, although wonderfully familiar to me, has its drawbacks. You can imagine what I’m referring to, the weather has become cold and the cloud low. Even so, you’re unlikely to catch me admitting to it being “really cold” until the temperature drops to around 2C/28F. We Brits are nothing if not hardy; the gene pool has adapted to withstand our errant island climate. 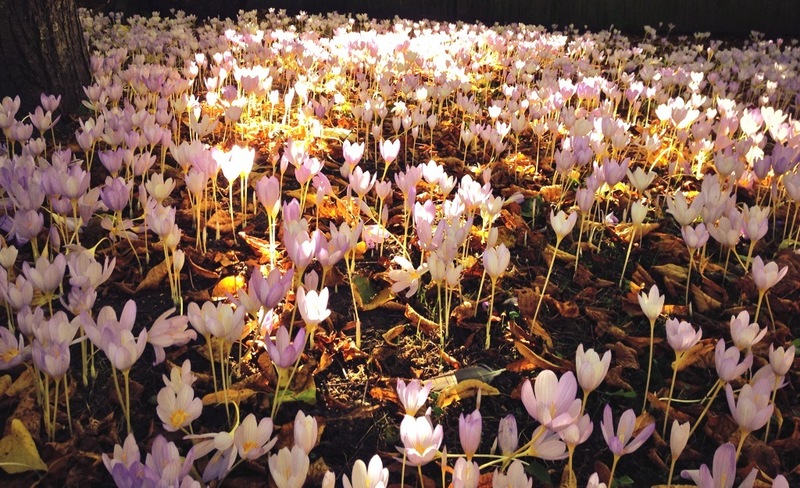 Just down the lane where I live, there grows a blanket of delicate Autumn crocuses. In November, each day I willed them to stay upright a little longer (not just because they are unusual and beautiful) I knew once they sagged back into the soil it would be a clear signal of Winter rushing in and daylight hours becoming shorter. Experiencing dusk by mid afternoon and darkness when you wake up does have an impact on mood. Many folk report suffering from Seasonal Affective Disorder. ‘SAD’ identifies a reaction or response of low mood and depression experienced by people who are otherwise unaffected throughout the rest of the year. According to Wikipedia the symptoms are recognised in America as effecting between 1.7% in Florida and 9.7% of people in New Hampshire. That’s a lot of folks. Lamps that simulate outside light can be purchased and do seem to help … but who wants to spend half of the year sitting in front of a lamp for goodness sake! I don’t believe I am a sufferer of SAD, my problem is one of relativity; fortunate to have lived in other, blouse clingingly hot places, I notice the cold now I’m back and take seriously my scarf and gloves routine. Unfortunately, the lack of light is not something you can control. I remind myself that In Singapore (and Houston) it was not always pleasant – returning to a roasting hot car and grappling with a steering wheel too scalding to touch. But being close to the Equator meant regular, light/dark daily cycles of approximately twelve hours, all year round. And frankly, it’s wonderful; everyone knows what they are doing, their brains are not constantly trying to reorientate and calculate if its time to wake up yet. The children used to accept that when it went dark, it was time for bed; ‘mother’ nature was living up to her name. Last time I repatriated back to the UK I anticipated I might notice less as time went on … and really it isn’t that cold, something I was reminded of when I read Aisha Ashraf’s recent blog (Expatlog) – Aisha lives in Canada, where it really does get cold – I have immense respect for people coping and in fact enjoying truly cold climates. For me it helps to write about life’s little difficulties and share them here; ‘A problem shared is a problem halved’. Sometimes I’ve worried about sharing too much. Jo Parfitt’s monthly Inspirer (another heart felt blog and she’s been at it many years) entitled Is it Dangerous to Overshare? reminded me recently why I do. Others may need to protect themselves and shy away at the thought of talking about anything personal with people they know, let alone share it on the internet with those they don’t. That is okay and its normal ‘Information is power’ after all. And in keeping negative experiences to ourselves we may hold them safe (I do that too sometimes) but what of the power of helping others by sharing? I met Jo Parfitt because I was lonely having arrived in Houston and decided to attend the 2009 Families in Global Transition Conference ‘FIGT’. Having been encouraged by Jo from the time I met her to write from my challenging place of isolation, I was, later on able to explore the pros and cons of publishing my memoir with her. Truthfully, I would probably not have discussed with many people my episode of depression, had I not taken the risk and had the memoir published by Summertime Publishing. The point was to share the learning from my loss of identity and depression in a way that was accessible and enjoyable for readers. Ultimately, I longed to write and found it cathartic to do so. “Just as well I’m not married to you then!” my reply. I know the friend was speaking ‘his truth’ and didn’t mean to cause offence, none taken, although I encouraged him to read the book before he commented further… Thankfully my own husband felt we had little to conceal. He, at least, wasn’t ashamed of my struggle or my words. As always, I would love to hear from you if you’ve time to put aside a few minutes from the mayhem of the festive season. 1) Read a review of An Inconvenient Posting (Laura J Stephens) which was published in Dutchnews.nl written by Shelley Antscheri. Click here for review. DutchNews.nl is the leading provider of quality Dutch news in English for an international audience. Some 18,000 people read DutchNews.nl every day, either online or through a free subscription to its daily digital newsletter. DutchNews.nl was founded in 2006. 2) Read a review of An Inconvenient Posting (Laura J Stephens) published in the popular blog Adventures in Expat Land, by Linda Janssen. Click here to read review. Linda A. Janssen is the author of The Emotionally Resilient Expat.